Oftentimes, it is the small details that grab my attention when considering to read a book. In this instance, it was the book cover. How can I not be curious about a man holding a gun to another man that appears to be digging a grave? Then I open the book to start reading and notice that every chapter heading has a watermark of a palm tree. I heart palm trees and instantly thought of my second home Miami! Low and behold, the story takes place in South Florida. So despite my full reading schedule, I made time to read Kill Two Byrds. Bernard Byrd returns from an overseas 120-day deployment to find two letters summoning him home. Due to a tragedy that occurred there years ago, he is not excited about the homecoming. The first letter is from a woman named Kayla claiming to have been a friend of Bernard's late uncle. The second letter is from the executor of his uncle's estate and advising of a will. His uncle was penniless so Bernard is sure this is a mistake. He heads home to straighten it out but finds things that don't make sense. Bernard and Kayla team up to find out the truth and discover deadly secrets of Uncle Marvin's life. Authors write better from experience. I can tell that Steven Lockett is a mystery fan. This is his first novel and he did a great job capturing the reader and unfolding the mystery while creating suspense. The main character was also likeable so I actually cared whether he solved the mystery. Can't go wrong with these elements! 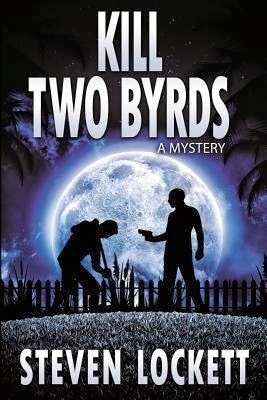 Kill Two Byrds has my stamp of recommendation. I look forward to reading more from this author soon. In the meantime, I'll stay updated on his new blog about writing. Visit http://stevenlockett.com/ for more info. No rants!!! I'm a happy guy lol! Thanks so much for taking the time to review the book! You know it's hard for a rookie out here so I really do appreciate it and I am very glad you enjoyed the story. Thanks so much for writing a great mystery, Steven.